The Animals were an English music group of the 1960s formed in Newcastle upon Tyne during the early part of the decade, and later relocated to London. Known for their gritty, bluesy sound and deep-voiced frontman Eric Burdon – as exemplified by their number one signature song "The House of the Rising Sun" as well as by hits such as "We Gotta Get Out of This Place" and "It's My Life" – the band balanced tough, rock-edged pop singles against rhythm and blues-oriented album material. They became known in the U.S. as part of the British Invasion. 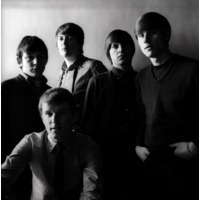 The Animals underwent numerous personnel changes in the mid-1960s and suffered from poor business management. Under the name Eric Burdon and the Animals, they moved to California and achieved commercial success as a psychedelic rock band, before disbanding at the end of the decade. Altogether, the group had ten Top Twenty hits in both the UK and U.S. The original lineup had a brief comeback in 1977 and 1983. There have been several partial regroupings of the original era members since then under various names. The Animals were inducted into the Rock and Roll Hall of Fame in 1994.